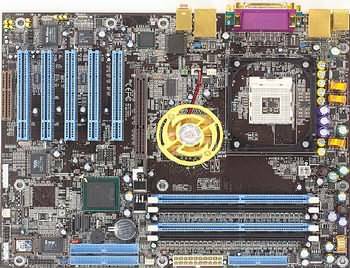 Chaintech Computer announced 9CJS Zenith motherboard on Intel 875P + ICH5R bundle for Intel Socket 478 Celeron/Pentium4 processors with 400/533/800MHz FSB. 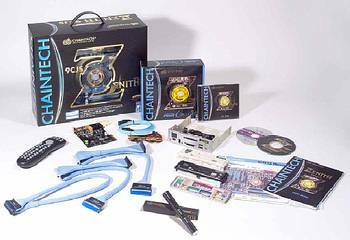 As 9CJS belongs to the Zenith series, buyers should get the most comprehensive package. Chaintech CBOX3 installed into a 5.25" bay provides front panel with IEEE1394, 2 USB ports, audio jacks; 6-in-1 reader (Smart Media, Memory Stick, Compact Flash, MultiMedia Card, Secure Digital, IBM Micro Drive), IR remote control receiver and DigiDoc display (80 POST codes and CPU temperature). The package includes white and black panels, Handigator – a remote supporting mouse features and Internet hotkeys, and WINDVD DVD player. Chaintech Multimedia Card for CMR slot (Chaintech Multimedia Riser) extends PC multimedia features with 2 IEEE1394 ports, 7.1-ch. audio jacks and SPDIF. Besides, the package includes round cabling and "4-in-1" screwdriver. Intel i875P (Canterwood) Chipsatz + Pentium 4 3.0C (FSB800). ASUS P4SDX Deluxe [SiS655 Chipset B0-Stepping]. 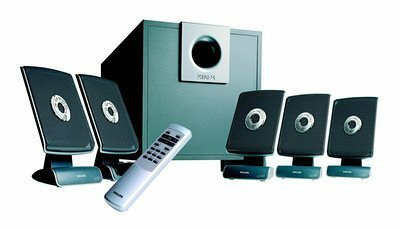 Terratec Home Arena 5.1 Speaker System. 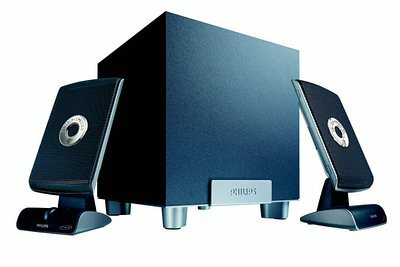 In the nearest future Philips will start shipping new soundcard and speaker systems announced at CeBIT. New external PSC805 Aurilium soundcard is positioned as a rival to Creative Extigy. 5.1-ch. PSC805 Aurilium can be connected to PC via USB2.0. It supports 24-bit audio, has built-in Dolby Digital and DTS decoders. In Europe the novelty will be available in May for about 99.90 euro. Besides, the company is also to ship two new sound systems: 2.1-ch. Acoustic A3 Fusion.310 and 5.1-ch. A3.610. A3.310 subwoofer power is claimed to be 20W RMS, satellite power is 2x6W RMS. A3.610 subwoofer peak power is to be 100W RMS, satellite power – 5x20W. Novelties will arrive to European retail in May. A3.310 should cost 99.90 euro and A3.610  270 euro. "For months now everyone has been eagerly awaiting the arrival of Intel’s 800MHz FSB chipsets and of course the P4 processors to go with them. During this time we have all been made very aware of the upcoming Springdale and Canterwood chipsets that will support the new front side bus. However, there are a few things most of us didn’t see coming that may alter the impact these new chipsets have in a big way." Read more at Legion Hardware. In mid-May LaCie is expected to ship LaCie Ethernet Disk drives with up to 500Gb capacity.